My daughter has a birthday party at Sweet-n-Sassy (if you don't have one locally, they are a great place for young girls and tweens to get their hair cut, have a birthday party, pedicure/manicure). The theme of the party is Red Carpet. I had to make this card quickly, as I forgot all about it with all the Halloween fun! Sorry for the shadow, I took this picture in my car on the way to the party. 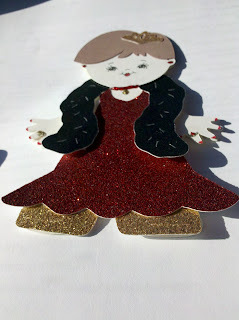 Cricut Cartridge: Paper Doll Dress Up. I set the height for 5.50 for all cuts. Hair - I cut the long part off so it looks like her hair is swept up. I also cut crown and shoes. Please leave a comment and if you like my blog, recommend it to a friend. Thanks for your support. I am so proud of my 8 years old son. His teacher last year has been out of school for 7 days due to her husband's illness. He came home form hockey practice and was very instint that he make a "get well soon" card for Mr. C. Once that card was done, he realized that he needed one for Mrs. C. (his teacher last year). He didn't want any help from me and used our little bug (Cricut) that the kids are allowed to use. I am so proud of my son for his thoughtfulness, creativity and caring about people that made such a difference in life. Wow, I am half way done with the 30 Day Challenge (even though I think was suppose to finish up the end of September). I wish I had more time to work on my crafts - someday when I win the lotto, that is just what I will do. If I could only remember to buy that lotto ticket! This is a centerpiece that I made for my dinning room table. The base is from Southern Living. It is the base of the cake holder, turn upside down. I filled it with a collection of orange and black glas discs, white glass ghosts and black glass bats from Pier 1. Next i used lollipop sticks from Michaels and used my Cricut to cut out Halloween items. I cut them at 3.5 inches (height). I did use my gypsy becasue I needed to duplicated the image and flipped it, so I could glue them "back to back." This whole project took approximately 30 minutes. Here are 40 boxes that I made (with the help of my kids) and stuffed with candy for all the kids that are coming to our annual Halloween party. I made this "Boo to you!" banner for Halloween and hung it over my kitchen window. It was so simple to make. I used the gypsy to "weld" the letters into the top layer of the banner. This was so easy and there are so many Halloween says you could use. Here is the invitation that was sent out to neighbors and close frineds. I used my gypsy for this project. I will admit this took me a while to get the design I wanted. Once I had that, I mass produced the card. It is easy to cut 25 mummys when using the Cricut! Stamps: My Pink Stamper - Spooky Puns (Tomb it may concern...) and the bat stamp was out of a dollar bin years ago. Stickles - black for spiders body, Christmas red for mummy's eyes, green for bat's eyes and yellow for the lampost light. My son has two birthday parties this weekend. The first one I made is for a little boy that LOVES hockey (like my son). The yellow B can be for.....Birthday, Buffalo Sabers, Boston Bruins, or their hockey team Bxxxxs. Thanks to Emma for another Throw Back Thursday! Please leave a comment, become a follower and recommend my blog to a friend. Here is a card that I made - participating in Emma's Throw-back Thursday Challenge (www.creativetimeforme.com). I used my "gypsy girl" to create the card. It was very easy and simple to make. Please consider becoming a follower and leaving me a comment. I am a mom trying to do it all....I have three children, work fulltime, spend lots of time at kids sports, lessons and other activities. This leave me very little for scrapbooking. When I am able to find time to use my "creative side" of my brain....I end up in my scrap-room. Usually this is late at night or very early in the morning. I made this card for a wedding shower. The bride loves Hydrangeas and will be the flower the wedding party will carry. The rose red color is the color of the bridemaids dresses. I hope you like this, the bride sure did! I got this idea from Robyn over at Mypinkstamper.com. If you are not familiar with all what she creates - make sure you check her out. My daughter's aide at school, daughter Hannah loves primary colors and animals. Abbie wanted to make something special for Hannah - so this is what we came up with.